Available in boxes of 20 and 50 bags. 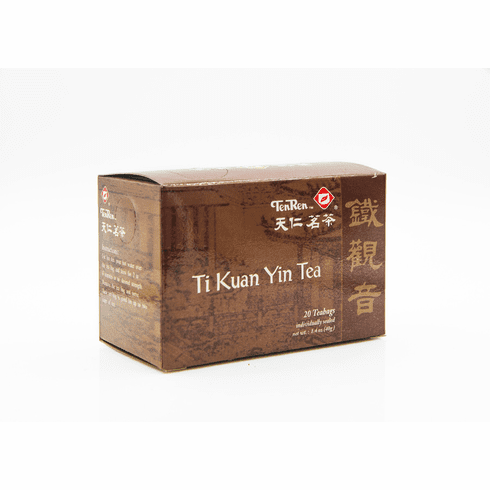 Ti Kuan Yin is a tea that is related to the oolong tea family as a semi-fermented tea. This tea is considered a dark oolong tea because it is baked longer and allowed to ferment longer than the typical oolong tea. Ti Kuan Yin from Taiwan tend to be more spherical than oolong tea leaves. The tea has a reddish brown color, a strong baked aroma, a rich taste, and a lightly sweet aftertaste. Water at about 185�-195�F or 85�-90�C should be used for steeping.